and how we use this technology in the design and construction of our buildings. 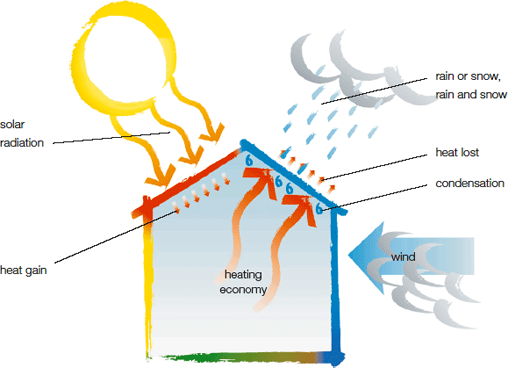 The energy needs of an Ecotek House are so low that cooling or heating is not required nearly all year. The most important element is super insulation, reducing heat loss in winter to keep the house warm or reducing heat gain in summer to keep the house cool. The most cost effective way to achieve super insulation is with the the award winning building technology of UK / Germany based Kingspan Insulation Plc. The Kingspan TEK Building System is a simple, but revolutionary, way of building your dream home quickly and with outstanding energy efficiency. Living in a home built using the Kingspan TEK Building System can allow you to benefit from future living standards today. A Kingspan TEK Building System home can not only provide comfort in terms of heating bills and temperature control, but it can also provide a spacious and desirable living space. Using this technology, walls can be no thicker than you would normally expect, in fact, in many cases, they can be thinner, but still provide equivalent, if not better, thermal efficiency. is warm, dry, and can be naturally lit.